A town-wide reusable coffee cup return scheme has started in Shrewsbury. The Shrewsbury Cup initiative, which aims to "cut unnecessary waste", has launched from nine independent cafes across the Shropshire town. Customers pay £1 to have their hot drink in a thermoplastic foam cup and return it to get their deposit back. More than 1,000 reusable cups have been used in the project's first week, co-founder Alison Thomas said. It's estimated 2.5 billion coffee cups, made from paper and plastic, are thrown away each year in the UK. 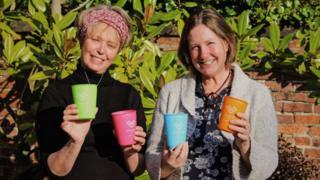 Ms Thomas and Sophie Peach, the co-founders of Community Interest Company (CIC) who are behind the initiative, spent a year developing the workable cup system to promote sustainability. "Shrewsbury is the first town-wide scheme with a number of the coffee shops collaborating," said Ms Thomas. "We're asking them to forgo their branding for the good of the environment, which is quite a big ask. "There's seven million single-use cups used every day in the country, which puts a strain on street bins and waste management services. We need to bring that number down." The brightly-coloured recyclable cups, made from polypropylene injected foam, can be returned to any participating cafe or dropped off at other sites, including Shrewsbury Library. Sam Gwilliam, the director of Ginger & Co Coffee, which uses the scheme, said he is "conscious of the impact a business like ours has on the environment." The project was seed-funded by the Shrewsbury Business Improvement District.